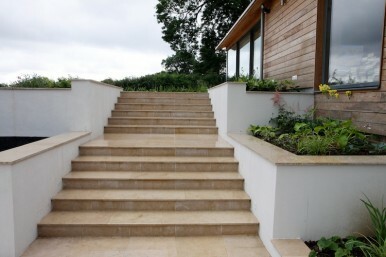 These garden steps were part of a larger project in Hampshire. After excavating a large amount we were able to place the foundations to exacting standards and dimensions. Drainage and electric conduits were positioned, and light locations marked, as we proceed to construct the step riser form-work to pour the concrete. The walls were rendered and painted, as were the risers after placing the limestone paving. The paving treads were laid with a 5mm pointing gap that was later filled with a coloured grout and a suitable fall from the rear. All materials were laid to exact dimensions and handled safely with care.